Today TSA Administrator Kip Hawley responded to the leaders of the Sikh community. He expressed understanding about the sensitivity and importance of the Sikh head dress screening. He said TSA takes their concerns seriously and is interested in reaching a workable solution that does not compromise security. We are writing to you because we are very concerned about a recent policy shift in screening procedures for the Sikh turban in United States airports. It is our understanding that on August 4, 2007, the Transportation Security Administration ("TSA") changed a longstanding policy on security screenings, recommending that passengers with turbans be pulled aside for secondary searches. This means that millions of Sikh travelers will be singled out based on their religious practice, violating the spirit of religious pluralism that is a founding principle of this country. We request that you meet with representatives of the Sikh community and other concerned communities to resolve our concerns. We want to work with TSA to develop a policy that will balance the nation's security concerns with the civil rights of those who wear religious headdresses. As you may be aware, Sikhs are required to wear turbans as an article of their faith. The turban, worn over unshorn hair, signifies a Sikhs' commitment to God, justice and to uphold the principles of his/her faith. Touching a Sikh's turban is a significant affront to his/her religious practice. In its new policy, the TSA equates searching turbans to searching a cowboy hat or a beret. This is unacceptable. A turban is a form of religious garb, not a fashion statement. TSA officials have admitted that the new policy, which specifically cites turbans as an example of headwear that could be used to conceal "threat items," was not thoroughly researched. Nobody responsible for this policy thought it necessary to familiarize themselves with the turban, or even confirm that a "threat item" could indeed be hidden in a turban. Nevertheless, without consulting the concerned communities, and with minimal guidance offered to their TSA screeners, the TSA's new procedures were implemented nationwide. The TSA has also kept the new screening procedures a secret. This leaves affected communities without a meaningful opportunity to comment upon the policy, or understand how their religious practice may be affected when flying. In addition, the policy on its face is vague and gives screeners unwarranted discretion to engage in possible religious profiling. According to over two dozen reports received by the Sikh Coalition so far, it is clear that TSA field officers nationwide are interpreting the new procedures broadly to target Sikh turbans. This religious profiling also puts an official stamp of approval on the public's stereotyping of Sikhs, Muslims, Arabs and South Asians as terrorists. Again, we request that you take up this matter urgently, and meet with our community groups to resolve the concerns raised by this new policy. While we fully appreciate the Department of Homeland Security's need to protect our citizens, the practical implementation of this policy means that screeners are conducting religious profiling. We strongly encourage the TSA and the Department of Homeland Security to reconsider their implementation of these new procedures. We thank you for your immediate consideration of this matter, and look forward to receiving your response. American Airlines flight 590 from San Diego finally made it to Chicago late yesterday, after being delayed in an incident involving passengers heard speaking Arabic. It turns out six Iraqi men on board work for a defense contractor and were reportedly taking the overnight flight home after a job at Camp Pendleton training Marines headed for Iraq. Their boss says some of the other passengers complained after hearing them speak Arabic. Everybody was ordered off the plane. According to the airline, law officers questioned the men and then quickly let them go. But by that time it was too late for the plane to take off until Wednesday morning. The defense contractor CEO calls it "an unfortunate situation," saying his men did nothing wrong. The owner of an upscale Salt Lake City private club is apologizing for turning away a Sikh man because his turban violated its no-hats policy. The Sikh American Legal Defense and Education Fund wrote a letter to Club Habits complaining that in July, Harpreet Singh Multani of Sandy tried to gain entrance to the club at 832 E. 3900 South but was told its no-hats policy applied to his turban. For Sikh men, the turban is a part of their religious identity. "It's a religious requirement for practicing Sikhs," said Rajbir Singh Datta, associate director of the Washington, D.C., organization. Club owner Bill Carter said Tuesday he had received the letter and that the club would issue an apology, and invite Multani to visit again. Irish Police Commissioner Noel Conroy has agreed to meet Sikh community leaders to discuss the ban on turbans imposed on officers. The move comes after a Sikh trainee officer was told that he could not wear the turban on duty. Members of Ireland's Sikh community are hoping to convince police to change the ruling. But police say that religious symbols could lead the public to believe that they are not acting "impartially". The man, who had already passed three stages of his training, was told of the ban before starting the fourth - in which he would have been working with members of the public. The Republic's police force, known as An Garda Siochana, requires all officers to wear standard issue uniform - including a cap. A statement issued on behalf of An Garda said that the public may view variations of the uniform as an indication that the force was not "policing all sections of society equally". A spokesman for the force told the BBC that they were currently "examining" their policy on all religious symbols, including crucifixes and pioneer pins. But the president of the Irish Sikh Council, Harpreet Singh, told BBC Radio Five Live that the turban was "a mandatory article of faith that a Sikh cannot take off". He argued that the rules meant that An Garda were "asking the whole Sikh community to stay out of the police force". Philip Watt, from the Irish Republic's National Consultative Committee on Racism and Interculturalism, also told BBC Radio that he thought the police had got it wrong. The largest organization of American Sikhs has expressed outrage at a new U.S. airport security policy that it said allows arbitrary searches of turbans, a sacred headdress in that religion. The Sikh Coalition said Saturday it had been informed by the Transportation Security Administration that under its new guidelines, turbans could be subject to manual pat-downs even if their wearers had passed a metal detector test. "The policy allows screeners to single out travelers on the basis of their religion," said Amardeep Singh, executive director of the Sikh Coalition, adding that the new TSA policy tells the public that "people who wear turbans are dangerous." TSA spokeswoman Lara Uselding acknowledged that on Aug. 4 the agency revised its screening procedures for head coverings but denied religious discrimination was involved. The new headwear policy also covers cowboy hats and some berets. The president of the Irish Sikh Council has dismissed reports that it is to pursue legal channels over a ruling which prohibits a Sikh garda reserve recruit from wearing a turban as part of his uniform. Harpreet Singh said members of the Sikh community will meet with Garda Commissioner Noel Conroy to discuss the implications of the decision not to allow the recruit to wear his turban. Mr Singh said he is hopeful that the matter could be resolved amicably. It has been reported that the Irish Sikh Council has been in contact with representatives of a New York police officer who successfully overturned a similar ban there. I am a 30-year-old Sikh girl born in New Zealand and brought up in Sydney, Australia. Over my lifetime in Australia, I have seen it mature into a wonderful multicultural society. I am now married to an Irish Catholic man, and have been living in Dublin for the last four years. On the whole, I found Irish people quite pleasant, curious about me and my background, but overall pleasant and peaceful people. I have made many friends here, and think it's generally a great place. As immigration is only really starting now, compared to some of the other Western countries, it's only natural that people are quite ignorant about other cultures. But unfortunately, ignorance usually brings about a lack of tolerance. I would like to help people understand the reasons why Sikhs wear a turban. The Sikh religion is only founded in the 16th Century in India. And in a society where there was constant war between Muslims and Hindus, the Sikhs needed to differentiate themselves so they weren't targeted by mistake, and hence they came up with various religious symbols. One of these symbols and a defining factor of a Sikh is the 'kesh' which is the long uncut hair that a Sikh keeps. Now to keep this tidy, most men tie their hair on the top of their head and wear a turban on top of it. If men did not wear the turban, they would have to cut their hair, and hence in part they would not be a Sikh anymore. 26 August 2007 By John Burke The Irish Sikh Council is considering mounting a High Court challenge aimed at overturning Garda Commissioner Noel Conroy’s ban on Sikhs wearing their traditional turban while on Garda duty.The Sikh council has also confirmed to The Sunday Business Post that it made contact with representatives of a New York Police Department (NYPD) officer who successfully overturned a similar ban in the New York police force.President of the Sikh council, Harpreet Singh, said the council intended to ‘‘take the necessary steps in the event that there is no change of position from the Garda’’ after a Sikh Garda Reserve recruit was told he could not wearing his turban while on duty. The wearing of the turban is considered a religious act by members of the Sikh faith.Sikh police officers in Britain, Canada and New York are permitted to wear a turban on duty. Singh said the council was examining the issue from a European law perspective but that it would not launch a legal action until meaningful dialogue had ended.Conroy released a statement late last week re-affirming Garda management’s decision to ban Sikhs from wearing a turban instead of the traditional Garda cap.In a strongly-worded statement, Conroy said he believed a variation to standard Garda uniform and dress, including those with religious symbolism, ‘‘may portray an image of the force that the public would not want’’.The statement outlined that the policy was binding on all members of the force, irrespective of religious beliefs. The statement outlined that the policy was binding on all members of the force, irrespective of religious beliefs. With the information made available to us, the Sikh Coalition has four principle concerns. * First the Coalition is concerned that the TSA guidance on how to implement the policy specifically lists the turban as an example of headwear that can be subjected to secondary screening at the discretion of the screener. We believe that the most precious article of our faith has become part of a government-mandated profile of a person who is a terrorist threat. * Second the Coalition believes that the new procedure should not be kept secret. It is critical that the procedures be made public so that the millions of air travelers subjected to them understand their rights while traveling. * Third the procedures are disturbingly vague. 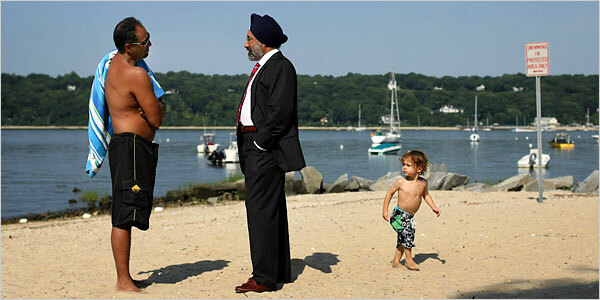 Screeners have personal discretion to subject a Sikh to additional screening, a turban pat-down, or to remove the turban. With 43,000 TSA screeners nationwide, and minimal cultural competency training, the Sikh Coalition is concerned that this will lead to religious profiling. * Fourth the Coalition is concerned that the new procedures were created without consulting any Sikhs or Sikh organizations to determine if safety concerns could be met without compromising religious freedom. A religious civil rights organization has complained to the U.S. Justice Department after a member of the Sikh religion was denied entry into two Carlsbad Village nightclubs because he was wearing a turban. Dave Bindra, 22, said the Ocean House restaurant and Coyote Bar & Grill would not let him in July 27 because they have rules against do-rags, beanies, bandannas and other head wear associated with street gangs. Town denies he made the “towel” remark and said Bindra and his friends were denied entry because they were being aggressive. Bindra, a Los Angeles native and a student at Carlsbad's Gemological Institute of America, said after he was denied entry at Ocean House he went to the nearby Coyote Bar & Grill, which did the same, so he asked for the manager's name and phone number and decided to call it a night. Bindra said after the Coyote refusal, three female friends had gone back to the Ocean House, which is in the same shopping center as Coyote, and demanded to see the manager. At that point, Town and Bindra agree, things spun out of control. “He was with three females who were going ballistic,” Town said, and added Bindra threatened his employees physically and used profanities. “I said, 'We're not going to let you in because you're attacking us,' ” Town said. Bindra said his friends were yelling profanities, but he did not. Bindra said he was not wearing a traditional peaked turban, but a patka, which uses less material and is more skull-tight. He said he also has a full beard, in observance of his Sikh religion. Town said Bindra's head wear did not look like a typical turban, and bouncers at the club told Bindra that he would be allowed into the club, but every club employee would question him because of the strict rules against head wear. Bindra said, however, that he saw the club admit patrons wearing baseball hats, and didn't understand why a rule against do-rags applied to him. The Sikh religion is one of world's newer faiths, having been founded about 500 years ago in Punjab, said Rajbir Singh Datta, a spokesman for the Sikh American Legal Defense and Education Fund. Datta said incidents of discrimination against Sikhs have increased since the Sept. 11, 2001, attacks and the invasions of Afghanistan and Iraq. He called the turban “the uniform of the Sikh religion,” and compared it to a Jewish yarmulke. Datta said his organization has contacted the Community Relations Service of the U.S. Justice Department, which mediates in instances of racial and ethnic discrimination. If the restaurants did deny Bindra service because he wore a turban, he would have a strong claim against them, said David Steinberg, a professor of civil rights law at San Diego's Thomas Jefferson School of Law. Steinberg said the federal Civil Rights Act of 1964 explicitly prohibits discrimination in “public accommodations” – such as stores, hotels and restaurants – based upon race or religion. On Wednesday the Sikh American Legal Defense and Education Fund (SALDEF), the nation’s oldest and largest Sikh American civil rights organization, met with the Transportation Security Administration (TSA) and other officials from the Department of Homeland Security (DHS) to discuss the impact on Sikh Americans of the recently implemented changes to security screening procedures at the Nation’s airports. The new airport security screening procedures implemented on August 4, 2007, allow the Transportation Security Officers (TSOs) greater “discretion” regarding passenger screening and to enforce additional screening for individuals who wear head coverings. As per the TSA, the new procedure is aimed at head coverings that can possibly hide a threatening non-metallic object. The guidance regarding the new screening procedure, provided to the 43,000 TSOs, lists the Sikh turban among others (cowboy hats, straw hats, etc. ), as an example of head coverings that may potentially hide a threatening non-metallic object. The Sikh turban is the only religious head covering cited in the list of example head coverings provided to the TSA airport security screeners. The new procedures explicitly exempts skull caps (religious or not) from the new screening process. Under the old procedure, travelers would only be required to undergo additional security screening if they were unable to successfully clear the metal detector or if they wore loose fitting clothing. Minutes before prayers were set to begin on Sunday, a foot-wide slab of concrete came crashing through a window of a Mississauga mosque. It was the second time in less than a month that the mosque has been targeted by vandals, and Muslim groups are asking police to treat the incident as a hate crime. There were 100 people inside the mosque when the window shattered. No one was hurt and many were unaware that anything had even happened. Those who saw the act of vandalism reported that two male teens rode up on bicycles and hurled what appears to be a chunk of patio stone through the window of the facility's control room. "It was a scary-looking thing," says M.D. Khalid, director of the Islamic Society of North America centre. "How much more daring can you be?" He estimated the cost of the damage to be about $1,000. The building houses a mosque as well as a Muslim secondary school, where students are due to return from summer holidays in two weeks. Earlier this month, a rock was tossed through the windshield of a van belonging to the mosque. Reports again identified two males on bicycles as responsible. "When it's twice in the same location, it leaves the impression that some people are prejudiced," says Khalid. "These incidents are not random." The mosque was also firebombed after Sept. 11, 2001 and Khalid is constantly increasing security at the mosque. "It's not a good feeling." Wahida Valiante, vice-president of the Canadian Islamic Congress, is urging police to treat the incident as a hate crime. "People could have died inside," she says emphatically. It's naïve to think that these incidents are not racially motivated, she adds. Peel police are investigating, but treating the incident as mischief for now. ``If several Muslim mosques within Peel were all targeted, then you can say okay, they're targeting a specific culture," says Det. David Bullock. Gardaí tonight defended its rule banning Sikh officers from wearing a turban on duty, claiming the force was not racist but trying to be impartial while providing a state service. Controversy erupted earlier this week after a Sikh man, an IT professional in his 20s, began training to join the Garda Reserve. Initially he was told wearing a turban would not be a problem but later a senior officer warned if he wanted to go on duty in a station, he would have to remove it, sparking criticism about the gardaí’s alleged outdated rules. Superintendent Kevin Donohoe of the Garda Press Office said the force was not advocating one religious belief over another and that An Garda Síochána had an effective intercultural policy. “There is no doubt that the Garda uniform and dress standards present unique issues in accommodating cultural diversity,” he said. “These are challenges faced by all facets of Irish society as diversity and integration more and more become real issues. “The Garda Síochána has, historically, been seen as providing an impartial police service, policing all sections of society equally. The Transportation Security Administration (“TSA”) released a statement on new airport screening procedures that authorize Sikh turban pat downs. TSA officials also told the Sikh Coalition today in Washington D.C. that it specifically included the turban as an example of a type of headwear that could potentially hide non-metallic threat items in a Guidance issued to 43,000 TSA screeners nationwide. The TSA did not provide the Sikh Coalition with a copy of the new screening procedure or the published Guidance on how to implement it. The Coalition first brought this issue to the attention of the Sikh traveling public this past Sunday. The Sikh Coalition continues to be alarmed that these procedures were put in place without community consultation or warning to millions of Sikh air travelers. The Coalition is also concerned that TSA will not provide a copy of the new procedure so that it can be reviewed by the public. Pressure is growing on the Irish police to allow a Sikh man training to be an officer to wear a turban on duty. The man, an IT professional in his 20s training to be part of the Garda Reserve, has been told he must wear a standard issue hat. Ciaran Cuffe, a Green Party member of Ireland's parliament, has written to Garda Commissioner Noel Conroy calling for the ban to be lifted. "The turban is a vital part of the rules of the Sikh religion," he said. "Sikh men are prohibited from cutting their hair or appearing in public without the turban. "In my opinion, the wearing of a turban would in no way impinge upon the operational effectiveness of a member of the force." An association of Sikh police officers in London has strongly criticised the decision. The Metropolitan Police Sikh Association said An Garda Siochana's uniform policy was 40 years behind the United Kingdom. "The question is not one of cultural integration, rather of religious rights and freedom to practise an individual's faith, regardless of jurisdiction," the group said. The Sikh man has said he will not be taking up his post and the Irish Sikh Council has also criticised the garda position. FBI agents are working through tons of tips they received after releasing a photo of two men who they say were acting suspiciously aboard Washington state ferries. Publicizing the photo of men who haven't been accused of a crime was an unusual move by the FBI. Officials with the Bureau say they just want to talk to the two men. The State Patrol says investigators started by showing the pictures to ferry workers, Then they showed them at a fire and police training exercise. With no new leads, they decided to get all the ferry riders involved by publicizing the photos and asking, "do you know who these men are?" Onboard the ferries, there's mixed reaction. When the Bainbridge ferry pulls away from the dock, the cameras come out. There's the family from London, "seeing the lovely views and trying to get the daily life of Seattle." The man who used to live here snaps photos and says, "It's just a chance to have something to remember things by." And scores of other tourists and travelers. But in the last month, there were also the two men in the FBI photos. The FBI won't say if two were taking pictures - just that the two were unusually interested in the size of the boats, how they work, and the docking procedures. They were spotted on different ferry runs on different days over a period of four to six weeks. The men appear to be of middle eastern decent, and the FBI admits there is profiling here -- but they insist it's not racial profiling. "We're looking at the behavior," said FBI spokeswoman Robbie Burroughs. "If you'd like to say we're profiling particular behavior, I'd be comfortable with that. Because this is behavior people felt uncomfortable with. "And this is what we're asking people to do. To be on the lookout for things they feel are unusual or suspicious." Ferry rider Kersas Dastur was taking pictures on board and says he sometimes gets second looks from people. "I gotta be honest, 50 percent of the people look suspicious," he said. "People think I look suspicious. I'm in the US military. I'm not suspicious." The release of the photo has angered many in the Muslim community. "These men look like Arabs," said Aziz Junejo. "What most people would personify as a so-called terrorist and the fear that our government is putting into people right now." The FBI insists that it's not trying to scare anyone and that they just want to talk to the two men and move on, and Aziz and Bureau officials agree that federal agents have developed an excellent relationship with the Muslim community. The big integration question: turban or not turban? I have been following with interest, the recent debate regarding the Garda reserve who was told he could not wear a turban with his uniform. While I sympathise with the individual concerned, I applaud the Minister's decision to stand firm on this issue. I have been living in the Middle East for the last few years, and despite the fact that I live in one of the more liberal countries in this region, there are a host of social "rules" which I must abide by. Some of these cause varying degrees of inconvenience to the non-nationals living here, while others are utterly discriminatory. That said, I am here of my own free will. My point is that the onus is on me to adapt to the society in which I find myself living, it is not up to that society to adapt to me. Surely the same should apply to foreign nationals who come to live in Ireland? We should be welcoming of other nationalities (absolutely), but not to the extent that it changes the fabric of our own national identity. l I am deeply shocked by the overwhelming support that Conor Lenihan is getting from people for his remarks about how a Sikh man must "fit in with our culture" and not wear a turban while on garda reserve duty, (Letters, August 17). Since when has Irish culture forbade the wearing of religious garments? I've heard arguments that when Irish travel to certain countries they must "cover up" in respect for a particular culture. This logic does not apply because these countries' cultures are governed by a particular religious belief. Ireland is supposedly a secular country and therefore is not led by a particular church's belief. Possibly more shocking is the letter that compares a Sikh's need to wear a turban to the cause of the London bombings. A top Irish politician is demanding An Garda Siochana scrap a ban on Sikh officers wearing a turban on duty. Government TD Ciaran Cuffe, Green Party, has written to Garda Commissioner Noel Conroy calling for the ban to be lifted. "The turban is a vital part of the rules of the Sikh religion. Sikh men are prohibited from cutting their hair or appearing in public without the turban," Mr Cuffe said. Mr Cuffe said the ban does not meet international best practice. Police forces in the UK, US, Singapore, Malaysia, Pakistan and India have no problem in allowing the wearing of turbans. Passport Canada will issue an apology -- and travel documents -- to three Sikh children whose passport applications were rejected because they were wearing religious headgear. The federal agency will also offer remedial training to passport staff to ensure a similar incident doesn't happen in the future, spokesman Fabien Lengelle said Friday. "It is resolved," Lengelle said. "As soon as we became aware of the issue, we called the parents and offered corrective measures." Lakhwinder Kaur Sidhu had mailed passport applications to Ottawa for herself and her husband along with their three children, Gurleen Kaur, 9, Ravneet Kaur, 7, and Gurmant Singh, 4, on May 15. All five had included passport photos in which they were wearing their religious headgear. Britons are more suspicious of Muslims than Americans and other Europeans are, according to a poll for the Financial Times. Only 59 per cent of Britons thought it possible to be both a Muslim and a citizen of their country, a smaller proportion than in France, Germany, Spain, Italy or the US – the other countries polled by Harris Interactive. British citizens were also the most likely to predict a "major terrorist attack" in their country in the next 12 months; to consider Muslims "a threat to national security", and to believe Muslims had too much political power in their country. However, on more personal measures of integration – having Muslim friends and accepting the marriage of their child to a Muslim – Britons showed more enthusiasm than some other countries. Melbourne's Jewish community has expressed outrage after a young man became the victim of a brutal anti-Semitic baseball bat attack. Ephraim Manshari, 17, had finished his shift and was sitting outside Mister Glicks takeaway with a friend in Balaclava on Saturday night when he saw a man he believed was a Sikh running past. The Sikh Coalition has learned that Sikhs are being subjected to heightened screening procedures, including mandatory turban pat downs, at all U.S. Airports. The Coalition became aware of the change not from the Transportation Security Administration (TSA), but through 4 Sikh air travelers who were subject to mandatory turban pat downs during the past two weeks. While the TSA acknowledges a change in policy has occurred, it has declined to provide details of the policy change for professed security reasons. The new procedures are in direct contradiction to a detailed turban screening policy that has been in place since November 2001. Shortly after the 9/11 attacks in New York and Washington, D.C. Sikh community groups worked closely with Department of Transportation officials to devise an airport screening protocol that would meet national security requirements, while safeguarding religious pluralism. The Sikh American Legal Defense and Education Fund (SALDEF) recently formed a partnership with the Metropolitan Police Department (MPD) of Washington, DC, to train all 3,000 officers of their force about the Sikh American community and their religious practices. The program, which has been ongoing since March 2007, has trained over 1,000 MPD officers to date. They join the roughly 5,000 local, state, and federal officers trained this year as part of SALDEF’s Law Enforcement Partnership Program (LEPP). Despite being part of the American landscape for about one hundred years, misconceptions still exist about the Sikh American community. Nine out of ten LEPP graduates have reported that what they learned will immediately help them better serve and protect their communities. The training program is designed to provide law enforcement with an understanding of the Sikh religion and provide recommendations on how to appropriately interact with the community in non-emergency, non-crisis situations. The program utilizes a professionally designed interactive presentation, SALDEF’s Training DVD On Common Ground, and other educational publications including our Who are the Sikhs brochure and SALDEF’s pioneering Law Enforcement Reference Card. A Muslim man is demanding police take action after, he said, he was discriminated against at a local mall. [Mayor Ted] Ellis was stunned. “I always knew there was an undercurrent, but this was a graphic illustration of that,” Ellis said. Ellis invited the man to his state of the city address in 2004 and outlined his goals to promote diversity and understanding in Bluffton. In the wake of that incident, the United Way of Wells County obtained a grant and formed a committee to look into ways of making the city more inclusive. That initial group struggled to gain traction and craft a cohesive message. “We had trouble developing a message that would get traction,” Ellis said. One thing that quickly became clear to the committee and to Ellis was a matter of semantics. Using the term, “diversity,” seemed to be a code word for race, where saying, “inclusivity,” led to a broader dialog on many issues. Soon the committee identified the biggest issues of inclusivity in the community as tolerance for religion and understanding the values of those living in poverty. Ellis said the key concept behind inclusivity and getting people to understand what is at stake is getting people to connect and feel involved. Ellis said that nearly everyone can recall some time in their life when they felt excluded, or left out. A Sikh family in Surrey, B.C., is upset because Passport Canada denied their children's passport applications, saying the religious head garb the children wore in their photos was unacceptable. Days later, the decision was reversed but the family is demanding to know why the pictures were rejected in the first place. Nine-year-old Gurleen Kaur Sihdu, one of the three children, is seen in her passport photo wearing a head covering but her face is clearly visible. An Ottawa woman who says she was the victim of racial profiling and harassment by the RCMP is suing the Mounties for almost half-a-million dollars. A statement of claim filed on behalf of Alev Dilaver, a manager of accounts payable at NAV Canada, says in August 2006 she was humiliated and insulted in an interview with two RCMP officers whom she alleges insinuated she was "involved with or had knowledge of an international criminal/terrorist conspiracy." Dilaver, who is of Turkish-Cypriot heritage and a Muslim according to the statement of claim, was asked to participate in an interview concerning the theft and recovery of a laptop belonging to her boyfriend at the time, RCMP Cpl. Rene Leclerc. Investigators have not ruled out the possibility that an arson fire set at a mosque in Antioch early Sunday morning was a hate crime, Antioch police Sgt. Tammany Brooks said today. FBI and Bureau of Alcohol, Tobacco and Firearms agents were called in to help local authorities investigate the fire, which began at about 12:30 a.m. Sunday at the Islamic Center of the East Bay, located at 311 W. 18th St., Contra Costa County Fire Protection District spokeswoman Emily Hopkins said. Four separate fires were set inside the mosque and one of them burned out of control, causing an estimated $200,000 in damage, according to Safaa Ibrahim, director of the Bay Area chapter of the Council on American-Islamic Relations. Somebody also made a hole in one of the walls, possibly to gain entrance to the building, Ibrahim said. Integration Minister Conor Lenihan urged the Civil Service to adopt a policy of hiring immigrants like the Gardai (police) do then hid his blushes as it was revealed a Sikh part-time member of the police reserve is banned from wearing his turban while on duty. While immigrant membership of police forces is well-established in many countries it is still a relatively new phenomenon in Ireland, and the Garda leadership is still reviewing how it recruits foreign nationals due to the low numbers who actually made it into the force. Of 7,000 foreign applicants, only 200 made it through to aptitude tests. Yet Lenihan, whose portfolio is a new one in the Irish government, insisted the force was “ahead of the pack” in making efforts to get staff from ethnic communities. Lenihan, younger brother of Justice Minister Brian Lenihan, said he had discussed with Garda Commissioner Noel Conroy the case of the turban ban on the Sikh member of the reserve. He said the commissioner and his staff were currently considering their position about ethnic forms of headgear for members of the force and its reserve. And, he added, it was only to be expected that immigrants to Ireland must accept Irish culture. Lenihan acknowledged that the issue of the turban is important for the Sikh community but he insisted, “If we are to take integration seriously people who come here must understand our way of doing things. The Sikh forbidden to wear his turban on duty is an information technology professional who, according to sources in his community, joined the Garda reserve from a sense of civic duty. hey preferred bookstores or hookah bars to mosques. They stopped listening to pop music and instead surfed Web sites promoting radical Islam. They threw away their baseball caps and grew beards. New York Police Department intelligence analysts have concluded those were some of the telltale signs of homegrown terrorists in the making -- a mounting threat as grave as that from established terror groups like al-Qaida. An NYPD report released Wednesday warns of a "radicalization" process in which young men -- otherwise unremarkable legal immigrants from the Middle East -- grow disillusioned with life in America and adopt a philosophy that puts them on the path to jihad. "Hopefully, the better we're informed about this process, the more likely we'll be to detect and disrupt it," Police Commissioner Raymond Kelly said while presenting the findings at a briefing of private security executives at police headquarters. In Quebec it's called "reasonable accommodation" when it comes to accepting the cultural practices of immigrants - and the debate on the thorny issue is about to be thrown wide open. Quebecers of all origins will have the chance in public hearings this fall to speak their minds about how immigrants should fit into the province. Philosopher Charles Taylor and sociologist Gerard Bouchard will chair the proceedings in 17 Quebec communities and are encouraging old-stock francophones, immigrants and anglophones to speak out on the subject. "We have to cover the shaky ground that we have neglected, hidden and pushed aside for years," Bouchard, the brother of former premier Lucien Bouchard, said Tuesday. "For better or for worse, we're going to deliberately navigate this shaky ground. We'll see if we survive or not, but we're convinced that it's what we now have to do"
Details of the hearings were announced against the backdrop of a public spat between Premier Jean Charest and Action democratique du Quebec Leader Mario Dumont over the number of immigrants needed in the province. Charest has accused the ADQ leader of being narrow-minded on the issue. Quebec currently accepts about 46,000 immigrants a year and Charest has been talking about a significant increase in that number. The hearings on the so-called reasonable accommodations will begin in early September and run until Nov. 30. Charest announced the hearings last winter after a lengthy and sometimes acrimonious public debate on the integration of immigrants into the province, a French-speaking minority in North America that considers itself a progressive, secular society. The controversy was fuelled by various events, including a small town's decision to set up a code of conduct for immigrants, as well as the banning of hijabs from sports competitions such as taekwondo and soccer. During this year's provincial election campaign, Quebec's chief returning officer received threats and was forced to overturn a ruling that allowed women to vote while wearing a niqab, a more extensive face-covering than the hijab. A Montreal community health centre came under fire for holding women-only pre-natal classes to make Muslim, Sikh or Hindu women feel more comfortable. Bouchard said while birthrates are low in many industrialized western societies, Quebecers are worried about their survival and their collective identity. "Everybody knows there are immigrants in Quebec, everybody knows there are different cultures, and so forth, but it's like all of a sudden a big part of French-Canadian Quebecers have just really become aware of it," he said. Dumont said Quebec needs more immigrants for economic reasons but must ensure "harmonious integration." The ADQ leader criticized Charest for wanting to increase the number of immigrants when the Liberal government has cut funding for integrating newcomers into the French language and culture. "We're a linguistic minority...and immigrants need francization," Dumont said. "It's quite a challenge." Meanwhile, Parti Quebecois Leader Pauline Marois said Tuesday she believes Quebec should have total control over immigration instead of the partial control it now has. Marois said immigrants must know that French is the common language in Quebec. An Antioch mosque that had previously been burglarized and vandalized was badly damaged by arson over the weekend, authorities said Monday. The blaze early Sunday caused an estimated $200,000 in damage to the Islamic Center of the East Bay and left the one-story structure on West 18th Street uninhabitable. Six engines responded to the blaze, which was reported around 12:30 a.m. Sunday and was out within half an hour, said Contra Costa County Fire District spokeswoman Emily Hopkins. Hopkins said that arson investigators have some promising leads, but that there is no evidence the fire had been set because the building was a mosque. The Irish Sikh Council has called for Sikhs to be allowed to wear turbans instead of caps when they join the Garda. The call follows a case where a Sikh who volunteered to join the Garda Reserve was refused permission to wear his turban as part of his uniform. The Garda Síochána today rejected the call for any variation in the standard uniform. Sikhs do not cut their hair for religious reasons and are obliged to cover it with a turban instead. According to Harpreet Singh, President of Irish Sikh Council, asking a Sikh community member to get rid of his turban "is like asking him to remove his head". Mr Singh instead called for Sikh gardaí to be allowed wear a turban carrying the insignia of An Garda Síochána instead of a standard issue hat. "We strongly believe and accept that as an immigrant community we should respect and adopt cultural values of Irish community," he said. "But we would like to stress that integration is a two-way process. Integration can never be brought about by asking the migrant communities to give up their basic beliefs." London, Aug. 12: Sikh taxi driver Davinder Singh, who complained to police after allegedly suffering a torrent of racial abuse from an aristocratic customer — the Marquess of Blandford — would have understood all, forgiven all and perhaps even sympathised with his tormentor if only he had been familiar with Satyajit Ray’s depiction of the crumbling of a once great zamindari family in Jalshaghar. Although he belongs to one of the noblest families in the land, the 51-year-old Marquess of Blandford could have inspired an evocative film on the last days of an old aristocratic English line had a person such as Ray existed in Britain. To the tabloids, Charles James Spencer-Churchill, Marquess of Blandford, born November 24, 1955, and heir, as his eldest son, to John George Vanderbilt Spencer-Churchill, 11th Duke of Marlborough, has long been a ridiculous figure. Marquess he might be and a distant relative of Sir Winston Churchill, but “Jamie Blandford” is now considered the upper class equivalent of Jade Goody, the reality television character with whom Shilpa Shetty clashed on Celebrity Big Brother. However, Jamie appears to have few of Jade’s redeeming qualities. All of Britain, with the exception of Davinder obviously, also knows that Jamie’s main claim to fame is that he is the UK’s best-known upper class drug addict. In fact, Jamie’s father is so fed up with his son that he has announced that his inheritance will pass not to son but his son’s son, George Spencer-Churchill. The boy was born in 1992 to Jamie and his first wife, Rebecca Mary Few Brown, (Rebecca, Marchioness of Blandford), whom he married in 1990 and divorced in 1998. George, incidentally, is called the Earl of Sunderland. But there is nothing that the 11th Duke can do to stop Jamie becoming the 12th Duke of Marlborough when he dies. To complicate matters and make all this sound though it was all taken from the pages of a P.G. Wodehouse novel, Jamie’s second marriage to one Edla Griffiths (Marchioness of Blandford), took place on March 1, 2002, at Woodstock Register Office. Although Jamie and his second wife have been living apart since 2004, their daughter, Araminta Clementine Megan Spencer-Churchill (Lady Araminta Spencer-Churchill) was born on April 8 this year. A SIKH member of the Garda Reserve is banned from wearing his ceremonial headdress, the turban. Integration Minister Conor Lenihan last night backed up the Garda Siochana ruling, saying immigrants to this country must accept our culture. Minister Lenihan said he has discussed the Sikh case with the Garda Commissioner Noel Conroy. The gardai are currently forming their views about ethnic forms of headgear for members of the force and the reserve. As turbans are worn by Sikh police officers elsewhere, most notably the London Metropolitan Police, a compromise may be reached. Sikhs wear turbans to cover the long uncut hair worn as a sign of their commitment to their religious faith. The turban is a headdress consisting of a long scarf-like single piece of cloth wound round the head or an inner hat. While acknowledging the issue of the turban is important for the Sikh community, the Minister supported the garda stance. "If we are to take integration seriously, people who come here must understand our way of doing things. When the President and Ministers travel to the middle-east, they accept cultural requirements of the country and the culture they are operating in. It is a vice versa situation with regard to Ireland." The Sikh man is an IT professional, who decided to join the Garda Reserve. The American Civil Liberties Union and New York Civil Liberties Union today filed a federal civil rights lawsuit charging that a Transportation Security Administration (TSA) official and JetBlue Airways illegally discriminated against an American resident based solely on the Arabic message on his t-shirt and his ethnicity. 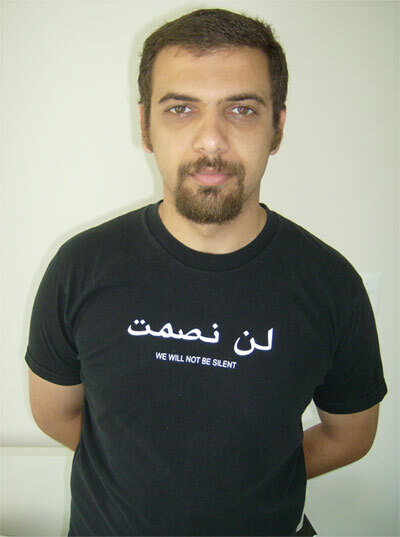 JetBlue and the TSA official, identified as "Inspector Harris," would not let Raed Jarrar board his flight at John F. Kennedy Airport until he agreed to cover his t-shirt, which read "We Will Not Be Silent" in English and Arabic script. According to the complaint, Harris told Jarrar that it is impermissible to wear an Arabic shirt to an airport and equated it to a "person wearing a t-shirt at a bank stating, ‘I am a robber.'" On the August 7 edition of Fox News' Your World with Neil Cavuto, Fox News contributor Richard "Bo" Dietl, a private investigator and former New York City Police Department detective, stated: "[I]f I see two guys that look like Aba Daba Doo and Aba Daba Dah, I'm gonna pull 'em over, and I wanna find out what you're doing." Dietl and host Neil Cavuto were discussing the arrest of two college students from Kuwait and Egypt who were allegedly found with pipe bombs in their car near a Navy base in South Carolina. The national Sikh Coalition is demanding that a Chicago bar change its policies after it denied entry to a man wearing a turban. The coalition is charging that St. Louis resident Nick Pujji, a 24-year-old law student, was turned away from Level Night Club Chicago, 1045 N. Rush, in the early morning of July 8. As a member of the Sikh faith, Pujji must wear a turban and beard. On the evening of July 7, Pujji, who was born and raised in the United States, also wore a button-down white dress shirt and jeans. At about 2:15 a.m., Pujji and a friend went to Level to meet people waiting for them there. Pujji said he had shown his identification and was ready to pay the $20 entry fee when the bouncer at the door told him he couldn't come in. "He said I can't permit you to walk in with that," Pujji said. "He made a circle motion around his head." Pujji explained that the turban was a part of his faith and that he had to wear it. He pointed out that he wore the turban in his driver's license. "He said, 'Look, you can't walk in with that,'" Pujji said. "I chuckled because it was so outrageous. I have the right to wear this as a symbol." Alvertos didn't mention a club policy against hats or other head garb, Pujji said. The manager wasn't hostile, but didn't relent, and said a Supreme Court decision supported his right to deny him entry, Pujji said. Pujji left, and his friend, who is white and non-Sikh, went inside. "That's something that would clearly fall as an act of discrimination" under Illinois and city of Chicago human rights acts, said Ed Yohnka, spokesman for the American Civil Liberties Union of Illinois. Reached on his cell phone July 27, Alvertos refused to comment. On July 19, the Sikh Coalition faxed Alvertos a letter that said he had violated state and federal anti-discrimination laws. "We hope to resolve the matter without going to court; however, if they refuse to change their policy we will do so in order to vindicate Mr. Pujji's rights," Coalition attorney, Harsimran Kaur, wrote in an e-mail. Incidents like Pujji's have increased in the Chicago area since 9/11, said Schaumburg resident Davinder Singh, 27, who is Sikh. "Because of the turban, Sikhs are seen as Arabs," he said. Singh, who was also born in the United States, was turned away from a Downer's Grove bar two years ago when a bouncer asked that he remove his turban. The bar has since closed. "I was a club deejay for a while," he said. "I have never had problems when I had to go in to do a job, but when I went in as a paying customer, issues sprout up." The incidents are also increasing as more first generation Sikhs like Pujji and Singh try to do mainstream things like go to bars, Singh said. His court appearances for a string of driving offences have been steadily mounting. Now it seems that even getting to court is causing problems for the troubled Marquess of Blandford. He is facing more hot water after being accused of racially abusing a Sikh taxi driver who had driven to collect him for an appearance at Coventry Crown Court. The revelation comes just days after the wayward aristocrat faced Oxford Crown Court for an unprovoked road rage attack. It was in July that driver Davinder Singh responded to a booking to take Charles James Spencer-Churchill, known as Jamie Blandford, to the West Midlands for a morning appearance on a different driving matter. The 51-year-old peer, son of the 11th Duke of Marlborough, called for a cab to pick him up from his farm home, in Woodstock, Oxfordshire, to take him to Coventry. Mr Singh, 46, said his problems began when he rang to check the exact location of the rural residence. He claims they escalated when he arrived and was greeted by a torrent of abuse. Blandford never made it to court that day. The shocked driver contacted police and Blandford was arrested and questioned on suspicious of racially-aggravated behaviour the following day. Last night Mr Singh told how he had been 'paralysed' with shock by the incident. "It was just unbelievable," said the father-of-four. "I can put up with rudeness but not racism. There is just no excuse for it. "I was having trouble finding his house so I called him and he said 'Why are you f***ing ringing me? You are the taxi driver you should know where you are f***ing going'." The driver claimed that when he arrived he was greeted by even more derogatory racial remark and called a Hindu. "He said I should remember I was a guest in this country and I replied that I was British," said Mr Singh. "He looked me up and down and said 'You? British?'. A state appeals court has ruled against a former Tioga County police chief who admitted spreading lies that two Lebanese-American men were involved in terrorism. According to court documents, James DeVita, then police chief in the village of Owego, made the allegations after the attacks of Sept. 11, 2001, on the World Trade Center and Pentagon. The chief admitted going around town in uniform, claiming that pizza shop owners Michael Yammine and Hassid Kazan, both naturalized Americans and fathers with long-standing ties to the community, were drug and gun runners in league with Osama bin Laden. He also admitted knowing that the claims were false, the court said. Neither of the men is Muslim. Police in Arizona said two unidentified men tossed a bottle filled with acid at a Phoenix area mosque early on Monday, splashing a caustic chemical near a Muslim cleric involved in a high-profile discrimination suit. A Glendale Police Department spokesman said two men driving in a red car threw a soda bottle filled with acid and a reactant at the Albanian American Islamic Center of Arizona, in Glendale, west of Phoenix, around 1 a.m. (O800 GMT) on Monday. The bottle, which contained pool cleaner and strips of tin foil, burst some 20-25 feet away from Imam Didmar Faja and another mosque official, although neither man was injured, sergeant Jim Toomey said. "The bottle ruptured in front of them and they smelled a strong chemical smell when it went off," Toomey said. "We are treating it as a hate crime. We are taking it very seriously," he added. he revelation comes just days after the wayward aristocrat faced Oxford Crown Court for an unprovoked road rage attack. "I was just completely shocked." Mr Singh, who has been a taxi driver for almost 25 years, said it was then that he turned down the £120 fare and drove off. "I would not take it," he explained. "Even if it was the Prime Minister I would not take him if he spoke to me like that. "He told me I would never work for the company again. It was like he was saying he could do anything because he was rich and I was poor. Police have launched an investigation into allegations controversial peer The Marquess of Blandford racially abused an Oxford taxi driver. 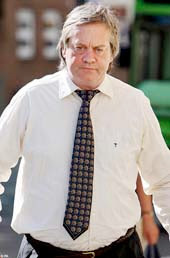 Thames Valley Police arrested and bailed the peer - who is heir to the Duke of Marlborough - on suspicion of racially aggravated behaviour after a complaint was made by Davinder Singh. Mr Singh, 46, who works for Radio Cars, alleged to police the 51-year-old, whose full name is Charles James Spencer Churchill but is also known as Jamie Blandford, racially abused him when he went to his Wootton Down Farm home in Woodstock to pick him up last month. He said part of the comments included that he was a Hindu. Mr Singh is a Sikh, not a Hindu. Mr Singh said he was left "paralysed" by the incident. He said it started when he phoned Blandford to confirm where his house was located on the morning of July 19 to take him to Coventry Crown Court. He then arrived at Blandford's home but refused to take him on the journey and called the police. Mr Singh said: "I am going to press charges against him, definitely. I am not going to let this go away." That day, Blandford missed a court appearance. Mr Singh, who holds a British passport and has lived in the UK for 24 years, has made a statement to police and is waiting on the outcome of their investigation into the alleged comments before pursuing his own claim for damages. Former heroin addict Blandford is the heir to the Duke of Marlborough, who owns Blenheim Palace estate, birthplace of Winston Churchill. On Monday, he appeared at Oxford Crown Court and admitted three driving offences - including a "road rage" attack on a car. In 1994, he was banned from using taxis after he admitted forgery and theft charges, including running off without paying. He is an outpatient at London's celebrity clinic, The Priory, and has been bailed to an address in south London so he can continue to attend. He will be sentenced next month. Thames Valley Police spokesman Toby Shergold said: "I can confirm Mr Singh contacted police making a complaint that he had been racially abused while he was picking up a customer in Wootton, near Woodstock, at around 10am on July 19. "On July 20, a man was arrested for racially aggravated public order and bailed pending further investigations." A refugee from war-torn Somalia, Bilan Nur, came to the United States and succeeded in getting a job as a customer sales representative with Alamo Car Rental in Phoenix. As a Muslim, she wore a hijab, or head scarf, during the holy month of Ramadan. But after the terrorist attacks against the United States on September 11, 2001, her employer refused to permit Nur to continue to cover her head at all, even though Nur was willing to wear an approved scarf with the Alamo Car Rental logo. The company fired Nur in December 2001 -- only eight days before Ramadan ended that year -- and declared her ineligible for rehire. The U.S. Equal Employment Opportunity Commission (EEOC) -- the federal government agency that enforces U.S. anti-discrimination laws in the workplace -- took up Nur's case. Hers was the first post-September 11 backlash case brought by the EEOC’s Phoenix District Office. President Bush repeatedly has spoken out in defense of religious freedom for all people. “America rejects bigotry,” he said in a 2002 speech. “We reject every act of hatred against people of Arab background or Muslim faith. Nonetheless, the years following the September 2001 terrorist attacks on New York and Washington saw an increase in the total number of cases filed with the EEOC because of discrimination based on religion and/or national origin. According to EEOC figures, the number of religion-based charges rose from 2,127 in fiscal year 2001 to 2,541 in fiscal year 2006. Of the 2,541 charges of religious discrimination received in fiscal year 2006, EEOC resolved 2,387 and recovered $5.7 million in monetary benefits for the people who placed the charges, EEOC figures show. To help victims of the post-September 11 backlash, EEOC has a Web site devoted to questions and answers about the workplace rights of Muslims, Arabs, South Asians and Sikhs under U.S. equal employment opportunity laws. It notes that employers are required by U.S. law to provide “reasonable accommodation” to allow employees to practice their religion. That includes allowing employees to work free of unlawful harassment because of their religious preferences and to wear religious garb within safety guidelines. Title VII of the Civil Rights Act of 1964 says, however, that an employer is not required to accommodate an employee’s religious practices -- including religious clothing -- if they impair workplace safety, cause co-workers to carry the accommodated employee’s share of potentially hazardous or burdensome work or conflict with another law or regulation. For example, a member of the Sikh religion, which generally does not permit shaving, lost his religious-discrimination case with Chevron USA Inc., which has a clean-shaven policy. The employee’s job required the use of a respirator that formed a tight seal with the face to prevent exposure to chemical fumes, which the company said was not possible with the employee’s beard. The circuit court determined in Bhatia v. Chevron USA, Inc. that the company had tried to accommodate the employee by attempting to find the employee a different but comparable job that did not require the use of a respirator, and that the company’s safety precautions were in line with federal regulations. The former employee alleging discrimination against Merrill Lynch has sent DNSI a copy of a press release regarding the suit, which we previously discussed. The press release is available here. FOREIGN doctors have been "victimised" in the aftermath of the failed bomb attacks in Glasgow and London, according to the new head of the British Medical Association. Dr Hamish Meldrum, who was born in the Capital and studied at Edinburgh University, said colleagues from overseas feared a backlash after the revelation that NHS staff may have been involved in the attacks. Several doctors were arrested in the wake of the failed car bomb attacks, though some have now been released. Dr Meldrum, who was appointed chairman of the BMA last month, said today: "There certainly have been reports from Middle Eastern colleagues that they have felt quite nervous following what has happened in Glasgow." He also spoke out against targeting doctors from abroad for tougher checks, and urged the authorities to show restraint. "To suggest, as one or two suggest, that we need to particularly toughen up on the checking of people who come from abroad, seems to me out of proportion," he said. Dr Meldrum also warned that all doctors felt under siege from increasing checks on how they carry out their work. Racist crime in the west of Scotland had increased after the suspected terror attack on Glasgow Airport, BBC Scotland has learned. Strathclyde Police have released figures on racist crime and a senior officer confirmed that there had been a noticeable rise. Community and political leaders were quick to call for calm in the aftermath of the attack. The force said the rise may have been down to a greater willingness for minorities to report incidents. Between 1 and 27 July, there were 258 reported racial attacks, 31 of which were airport-related, according to Strathclyde Police. Previously, the force had been dealing with around 200 such incidents a month. Harvinder Anand, the new mayor of this Long Island village of multimillion-dollar homes, private beaches and yachtsmen, is, like many other residents, a successful business executive, a boater and a connoisseur of world travel. His Sikh turban and beard drew double takes when he moved to the community about 10 years ago, but it does not get many anymore. At least not among the locals. Nonetheless, Mr. Anand’s way of standing out in the crowd of Bermuda-shorts-and-loafer-wearing people who elected him in June — he ran unopposed — attracted television crews from American and Indian networks to his inauguration on July 2. The newscasters described the election of Mr. Anand, 47, a New Delhi native who is the first member of any minority group to be mayor of this 95-percent-white community of 2,000 fronting on Cold Spring Harbor, in eastern Nassau County, as an unparalleled event. Homeland Security Secretary Michael Chertoff met with more than 40 young American Arab, Muslim, Sikh, South Asian and Middle Eastern leaders July 25 to cap a unique two-day roundtable designed to gauge the views and aspirations of young people from these communities. The participants, ages 18-25, took part in a "Roundtable on Security and Liberty: Perspectives of Young Leaders Post-9/11." The roundtable was organized by the U.S. Department of Homeland Security's Office for Civil Rights and Civil Liberties in collaboration with George Washington University Homeland Security Policy Institute and occurred at George Washington University Law School. Other such roundtables are expected to be held in other cities across the country. • Toronto, London and Madrid: Can it Happen in America? • Careers in the U.S. Government. "This was a tremendous opportunity to engage young leaders and discuss some of the most significant issues our country is confronting," said Daniel Sutherland, the Department of Homeland Security's Officer for Civil Rights and Civil Liberties. "We had a frank and constructive conversation on the challenges young Americans from ethnic and religious communities face, the importance of protecting civil rights, the potential for alienation and radicalization in our society, and the best ways to encourage public service." The purpose of the youth roundtable was to allow senior government officials to have direct communication with young people from these communities. The government has increased efforts to engage with community leaders of civil rights organizations, NGOs, and scholars. For example, in the past several months, Chertoff met with various civil rights leaders, interfaith leaders at a mosque in Dearborn, Muslim leaders at a dinner in Germany, and Muslim business leaders in Washington, D.C. and Detroit. This roundtable was organized to ensure the Department is also engaging youth and reaching out to a wide spectrum of people from these communities. The young people discussed stereotypes of their communities in the media and the general public, their reactions to government policy, and the strength of social service organizations that serve these religious and ethnic communities. They identified the types of people who are influential in their communities, and the sources of news and information that impact them. They described the basic challenges facing young people from these communities, including concerns about employment discrimination, restrictive government security policies, and general misunderstanding in the public.